Damn cultists! They never know when to let an ancient sleeping god lie. Now, it’s a fight for the fate of the world with the odds stacked against us. It’s enough to drive you mad… Set in the creepy world of H.P. Lovecraft, Cthulhu: Death May Die (C: DMD), the new game from CMON and Guillotine Games, will create nightmares for anyone brave enough to open the box. In C: DMD, players take on the role of Investigators who have just come to a conclusion on their latest case, and the reality is terrifying. At the start of the game, Cultists have already started an unstoppable ritual that will summon an Elder One, a god from a place beyond time and space. They have been in a death-like slumber for eons, but now they’re stirring, and before the night is over, they will arrive. The only hope is for the Investigators to disrupt the ritual enough so that when the ancient deity arrives, for a brief moment, it’s mortal. It’s not much of a plan, but it’s the best they’ve got. C: DMD is played in customizable games made up of two parts. The Elder One is the ancient, evil god the Investigators are going to have to face off against. They come with their own set of Cultists, Monsters, and cards that will challenge the Investigators’ efforts. The Episode sets the stage for the epic battle. It includes the story card featuring the map layout, victory conditions for the Investigators, and any special abilities or actions that may be available for the game. The Episode also comes with a set of monsters and the Discovery cards that feature Items and Companions they might find while investigating the map. During the game, the Story Board is the central hub of information for the players. It houses the Episode card, detailing the objectives of the game, and the Elder Ones cards stacked in their different stages. But, most importantly, is shows the advancement of the Elder One, as the ritual progresses and it gets closer and closer to our world. This is represented by the Summoning track, where the Elder Ones menacing miniature will inch forward towards its arrival on the board. Once it hits a certain point, it will manifest in the world. The Investigators have their own personal boards to track some of their important stats. They have a Wound level, showing the damage that has been inflicted on them, a Stress bar, which they can raise to reroll dice, a Sanity bar, with several thresholds that can be triggered throughout the game, and a set of three Skills which can be increased throughout the game. Each Investigator will also start the game with an Insanity card. When their Sanity bar passes certain thresholds, their Insanity is triggered and they must follow the instructions on the card. Luckily, this is also how they level up their Skills, so it will sometimes make senses for players to loosen their grip on their Sanity. On their turn, Investigators will complete three actions, such as Moving around the Map, Attacking the minions of the enemy, Resting on safe spaces to regain Stress and Wound levels, or Trading items with other Investigators on the same space. At the end of each turn, Investigators will draw one or two Mythos cards, depending on how close the Elder One is to our world. Mythos cards drive the horrors of each scenario. They summon enemies, drive players mad, or some can get really nasty. Some Mythos cards also have a summoning symbol for the Elder One. If the number of symbols in the discard pile is three, the Elder One advances on its track and the Mythos deck is shuffled. As bad as the odds are stacked against the heroes, they are after all Investigators. If they end their turn on a safe space, they can draw Discovery cards which add to the narrative flavor of the game. Most provide them with a choice, and may result in them claiming Items, Companions, or Conditions. Throughout the game, the Elder One will be marching forward, but it will eventually arrive on the map when it covers the last yellow space of the Summoning track. Whether or not it’s mortal will depend on if the Investigators have completed a Ritual. Each Episode has a Ritual (or set of objectives) that must be completed before the Elder One can be attacked like any other enemy in the game. Even if the Investigators haven’t completed the Ritual, the Elder One will be able to attack them and wreck havoc on their plans. If they thought the situation was difficult without an ancient god bent on killing them, it’s about to get really messy. When the Elder One arrives, a Progress marker will be placed on the Summoning track on the same space and will continue to advance. Once it hits the end of the track, the Elder One will be immortal and all will be lost! On the subject of losing, the players will also lose if an Investigator is killed or goes completely insane before the arrival of the Elder One, if all the Investigators are killed or go insane once the Elder One has been summoned, or as mentioned, the Progress marker reaches the end of the Summoning track. To win, the Investigators must kill the Elder God once they’ve arrived on the board. Hey, no one said it was going to be easy. With different Elder Ones to choose from, wildly different Episodic settings, and Insanities that will dramatically affect the way each Investigator plays, C: DMD offers a new nightmare each time it’s played. The stage is set with incredible art from Karl Kopinski, Adrian Smith, and Nicolas Fructus, the indescribable horrors of H.P. Lovecraft take a physical form with miniatures sculpted under the supervision of Mike McVey, and two of the most brilliant designers in the world today are responsible for the design, Eric M. Lang and Rob Daviau. Destroying the Elder Ones won’t be easy… it may cost your sanity, or your life, but the fate of the world lies on your shoulders. 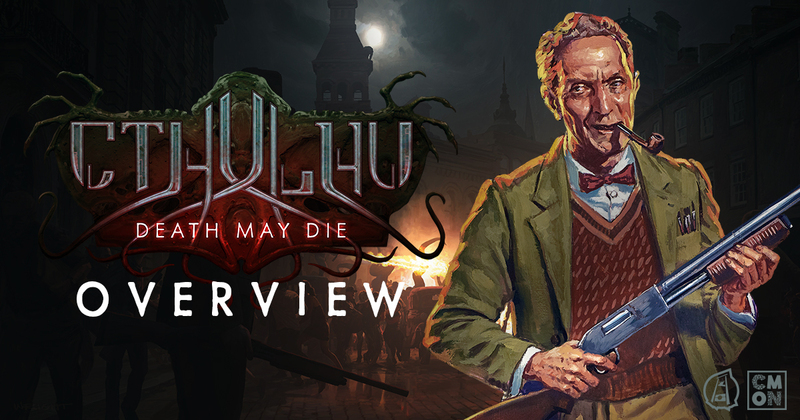 Cthulhu: Death May Die is coming to Kickstarter soon. Stay tuned for updates as we inch closer to the arrival of the Elder Ones.